In the July issue of Wine Spectator there is an informative editorial about wine vinegar. Matt Kramer gives the mis-treated condiment its full due, he explains that, in fact, there are great wine vinegars and it is no coincidence that they are made by some of the best winemakers. Mr. Kramer names Castello di Volpaia in Tuscany as the maker of the best wine vinegar and he notes that they grow a specific type of grapes for making vinegar. Vinegar master, Giovanella Stianti explains that “you don’t want an alcohol level over 10 percent because that interferes with the bacterial fermentation.” After Ms. Stianti ferments the grape juice with a mother starter and oak and chestnut shavings, she moves the vinegar to age in chestnut and oak vats. The vinegar is then moved to oak barriques where it stays for about a year. No wonder this is a standout favorite for Mr. Kramer, and Chef Tom Colicchio( who names the vinegar in his book Think Like a Chef), it is a labor of love. So what do you do with a great wine vinegar? You can make an excellent Salsa Verde (parsley, garlic, anchovies in salt, capers, olive oil and white wine vinegar blended like pesto) for meats. Carpione di zucchini is excellent, pan-fried zucchini get a bath of wine vinegar and can be stored in this liquid. And Mr. Kramer suggests you drink a Dolcetto or a Chianti with your dinner although he says “it’s the vinegar that steals the show”, I would also recommend a Roero Arneis to pair with the carpione di zucchini . Give it a try, at Piazza we have both the white and red wine vinegars from Castello di Volpaia. Gianni Calogiuri also makes vinegar with care, he grows special grapes for making his vinegar. We carry his vin cotto. We will be working for wine from here on out (everyone except Hudson or Alex). We did it, we have been approved to sell beer, wine and liquor for consumption off-premises. That means no glasses of wine with your lunch and no bottles upstairs. It does mean that we are having our first wine tasting this Saturday from 2-4 pm!! We will be trying three wines (not sure which ones yet) and two cheeses! Very exciting. A few customers have expressed concern about where the wine will physically fit in the store. Don’t worry! The layout of the store is like a puzzle, I will contract and relocate other things to find space for the wine. The wine is not going to take over the store, we are a deli that will now carry wine. To avoid any confusion and violations of our own three of our employees shuffled off yesterday to a Techniques of Alcohol Management class. Currently 5 of the 7 employees are TAM certified and at least one will be on premises during operating hours. 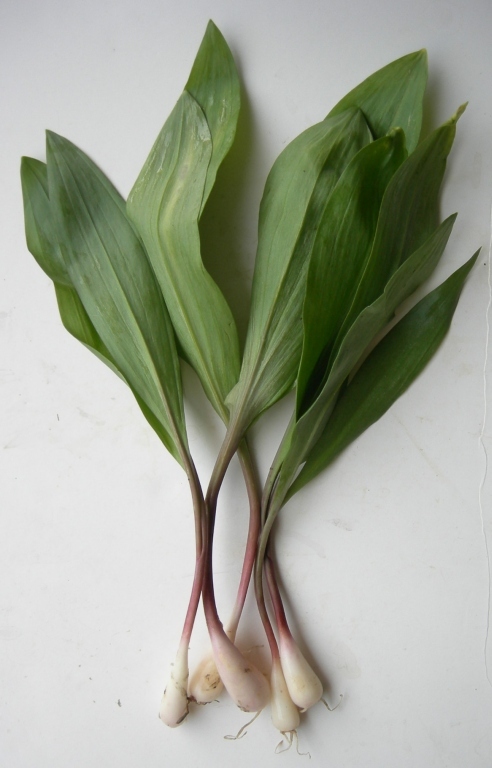 More signs of Spring– ramps have arrived! A wonderful wild onion, like a leek without all thetough fibers. 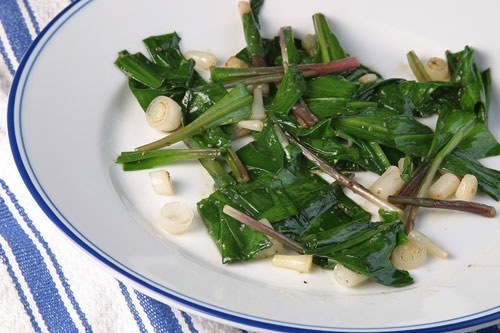 You pretty much eat the whole thing, the slim stems and the greens. We are selling them for $6.10 a bunch and they are going fast!! Now what to do with these lovlies; saute them, make soup out of them, blanch and blend with mashed potatoes, scramble with eggs, pickle them… here are some recipes for ramps including one with spaghetti! Chickpeas are an ancient grain, nutty and so good for you that they are often dismissed as health food or a canned thing at the salad bar. Well, there is a solution to every problem and I am here to tell you that in this case deep frying is the answer. In Sicily they make little chickpea flour fritters called panelle (I believe that Naples has a version of it own). Made from a mixture of chickpea flour, water, parsley and eggs, the batter is formed into thin patties, fried in olive oil then served with a little ricotta salata and a squeeze of lemon in a sandwich. I first tried panelle in Brooklyn at Fernando’s Foccaceria on Union St. in Carrol Gardens. They were very cheap, very thin and very good. I have been staring at the bags of farina di ceci here at Piazza thinking about those little pillows of fried goodness but last night I decided to try to make them myself. Suggestion number one: deep frying is difficult if you have a cook-top stove. The ‘cycling’ of the power makes the temperature of the oil fluctuate wildly. Suggestion two: use floured hands to form the fritters. Suggestion three: let them cool before you take a big bite or else you will kill the roof of your mouth. Ouch, I didn’t wait.